When a car features a design as energetic as the Civic’s, it should have an engine to back it up. The Civic has two. Whether you go with the standard 2.0L four-cylinder or the 1.5L turbocharged four-cylinder, the 2017 Honda Civic Sedan performance specs should impress, leaving competing Kennewick sedans feeling a bit weak. Old-school drivers need not fear, as the Civic returns with a time-tested six-speed manual transmission — and you can always upgrade to the available CVT for improved efficiency. The standard engine of the Civic is anything but standard, offering more power and torque than many of its competitors. Honda’s four-cylinder engine has been honed over the years, and the entry-level Civic’s performance specs are proof of that — it offers 158 hp at 6,500 RPM and 138 lb-ft of torque at 4,200 RPM. Upgrading to the turbocharged engine almost feels like magic; despite bringing more power and torque to the table, this powertrain is also more efficient than its 2.0L counterpart (see the estimates in our transmission breakdown). With 174 hp at 5,500 RPM (6MT) or 6,000 RPM (CVT) and either 167 lb-ft of torque at 1,800 at 5,500 RPM (6MT) or 162 lb-ft at 1,700 at 5,500 RPM (CVT), the Civic aims to redefine the small car. Honda’s lineup has been known for its efficiency for decades, and that goes double for the Civic. Efficient engineering only goes so far, though, and the Eco Assist System wants to make you a more efficient driver. Blue bars around your speedometer slowly change to green to indicate and encourage more efficient driving practices. When you drive the Civic, there’s no need to worry about juggling between the clutch, brake, and accelerator when parked on a hill. Hill Start Assist holds the car secure until you are able to give it enough gas to move — no slipping backward or forward on a hill or a driveway. The 2017 Honda Civic safety features are designed into the vehicle from the start, beginning with the very frame it’s built on. 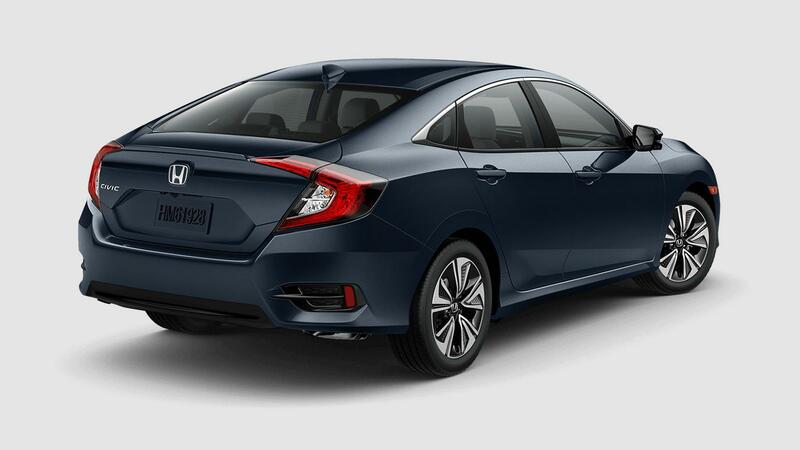 Standard technologies like Vehicle Stability Assist and a multi-angle rearview camera bring even the entry-level LX to new heights of safety, and the available Honda Sensing package equips the sedan with driver-assistance features that can help you actively avoid an accident. Each Civic carries a multi-angle rearview camera as a standard feature, offering top-down, wide-angle, and standard views of what’s behind the car. Shift into reverse and the display screen broadcasts what the camera sees, complete with guidelines so you can back up and parallel park with confidence. Upper trim levels feature dynamic guidelines that adapt as you move. ACE stands for Advanced Compatibility Engineering, and the name alone should make it clear that this car was designed with safety in mind. Honda has reinforced common collision areas while ensuring the frame is designed to crumple and actively direct energy from an accident away from the passengers. When you want a safe car in College Place, you want one built on an ACE Body Structure. This standard safety feature checks the position of your tires against the position of the steering wheel and monitors for loss of traction. If it senses understeer, oversteer, or slick pavement, it can adjust engine performance and apply braking power to restabilize the vehicle and put it back under your control. If you have something heavy in the trunk or are driving alone in your Civic, it may not feel like anything is out of the ordinary, but your brakes could tell a different story. Electronic Brake Distribution accounts for weight imbalances in the vehicle and applies enough stopping force to each wheel to slow them all down evenly, even if passenger and cargo weight isn’t evenly distributed throughout the vehicle. Safety technologies have come a long way in a short time, and there’s more to them than seat belts and airbags. Honda Sensing is available on every trim level (standard on Touring models) and includes advanced driver-assist features like Collision Mitigation Braking, Lane Departure Warning, Forward Collision Warning, Lane Keeping Assist, and more. While no substitute for safe driving, Honda Sensing gives drivers an extra set of eyes on the road. With all of the attention to safety, it’s little wonder that the National Highway Traffic Safety Administration awarded the 2017 Honda Civic Sedan their highest score: a 5-Star Overall Vehicle Safety Rating. *** This score comes from a combination of front driver and passenger crash-safety tests, side-impact tests, and rollover tests, examining all levels of safety. For many small cars, the cabin design is adequate at best, but the 2017 Honda Civic Sedan interior is changing things. A streamlined design brings those same head-turning curves from the body into the cab; whether you’re driving the entry-level LX trim or the top-of-the-line Touring, all of the tech features look like they’ve been designed to fit right into the dash, console, and steering wheel — because they have. Premium comforts like leather-trimmed upholstery and heated front seats let the upper Civic trims compete against luxury sedans while advanced connectivity features keep Honda’s small car feeling ultra modern. Available on EX and higher trim levels, Apple CarPlay® and Android Auto™ let the Civic speak the same language as your smartphone. Not only do these services offer a seamless connectivity experience, they also bring familiar apps with them, like maps, messages, and more. Apple CarPlay® and Android Auto™ are the next evolution of car connectivity, and they’re on the Civic. EX and higher trims feature a 7-inch Display Audio touchscreen with 800×480 WVGA resolution and customizable settings to personalize your display. This electrostatic touchscreen lets you manage vehicle settings, control your media, and easily pair a device over Bluetooth with just a few taps on the screen. Bring up your favorite Pandora station, display SMS texts, and control your Apple CarPlay® and Android Auto™ apps on this crystal-clear display. Standard on the Civic, Bluetooth HandsFreeLink offers handsfree phone calls when paired with a smartphone and allows you to stream audio directly from any Bluetooth compatible device. Simply pair the device to the Civic once and your car will recognize it and connect automatically in the future for easy streaming and constant connectivity behind the wheel. While the Civic features 160-watt and 180-watt audio systems, the Touring trim goes all out with this 450-watt 10-speaker model. Customize your driving soundtrack and know it will sound pristine through the speakers of your Civic whether you’re hitting the highway for a road trip or making the daily commute. Available on EX-L trims and standard on Touring models, the Civic’s satellite-linked navigation system offers turn-by-turn directions, responds to voice controls, and directs you to points of interest on the way to your destination. More than just a set of directions, this navigation system syncs up with HD Digital Traffic and routes you around potential traffic jams to minimize time to your destination. Get comfortable in the Civic regardless of the season with heated seating; just choose your comfort level and warm up, even in the dead of winter. Heated front seating is found on EX-T, EX-L, and Touring models, with heated rear outboard seats keeping the rear passengers warm on EX-L and Touring trims. At Walla Walla Valley Honda, we believe there is a 2017 Honda Civic for each College Place and Kennewick driver. With five main trim levels that offer a wide range of technology, convenience, luxury, and safety amenities as well as a long list of available interior and exterior accessories, it’s just a matter of building the right Civic for you. As the entry-level trim, the LX lays down the foundation for the Civic models above it. Standard features like a multi-angle rearview camera, Bluetooth HandsFreeLink, and a 5-inch LCD screen make it clear this is no ordinary small car. Give it a safety upgrade with the available Honda Sensing package and add Collision Mitigation Braking, Adaptive Cruise Control, Lane Departure Warning, and more. Step up to the EX trim and give the LX technology features an upgrade with the 7-inch Display Audio touchscreen, Apple CarPlay®, Android Auto™, and HondaLink telematics. Enjoy your favorite Pandora internet radio stations, send and receive SMS texts, and use your favorite apps through the new touchscreen interface. The Honda LaneWatch feature mounts a camera on your passenger side mirror for a detailed look at your blind spot, too. The turbocharged Civic revolution starts here, with the EX-T trim. In addition to sporting the new 1.5L turbocharged powertrain, the EX-T includes all of the features of the EX and adds on fog lights, a body-color decklid spoiler, dual-zone automatic climate control, and heated front seating. Few mid-range trims can compete with what the Civic EX-T has to offer. Luxury becomes a top priority on EX-L models; in addition to the features and turbocharged engine of the EX-T, it wraps the cabin in leather upholstery, adding a leather-wrapped steering wheel and leather shift knob. An eight-way power-adjustable driver’s seat makes it easy to get comfortable, and heated outboard rear seats keep passengers warm in the back. Honda’s satellite-linked navigation system is available for upgrade, bringing voice recognition technology with it. 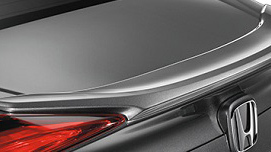 Everything that was standard or available on the lower trims is found on the Touring model, including Honda Sensing safety features and navigation. The Civic Touring competes against some of the most luxurious small cars on the road thanks to its long list of technology, comfort, and entertainment features, with exclusives like its 540-watt 10-speaker stereo system, LED headlights, chrome exterior accents, and more. The 2017 Honda Civic accessories let you customize virtually every aspect of the vehicle. Body-color trim elements can give the 2017 Honda Civic Sedan a sportier feel while splash guards and a rear bumper applique protect the finish of your Honda. Interior accessories like all-season floor mats and door sill trim work to keep the cabin looking pristine, and electronic accessories like the wireless phone charger ensure your Civic meets your tech needs. * MSRP excluding tax, license, registration, $835.00 destination charge and options. Dealers set own prices. ** Based on 2017 EPA mileage estimates. Use for comparison purposes only. Do not compare to models before 2008. Your actual mileage will vary depending on how you drive and maintain your vehicle. *** Government 5-Star Safety Ratings are part of the U.S. Department of Transportation’s New Car Assessment Program (www.safercar.gov). Model tested with standard side airbags (SAB).